For Caltrans crews, Tuesday was a notable and emotional day on the job as they returned to a job site on Highway 17 for the first time since a colleague was killed last week in a freak accident. Workers returned to clean up mud and debris from a slide last week near Scotts Valley in the Santa Cruz Mountains. On Thursday, 54-year-old Robert Gill was struck and killed by a dump truck in a secured work zone there. Another worker also was hit and injured. Work was suspended immediately Thursday, as the accident was investigated. Highway 17 was still a mess Tuesday as crews returned to work. Caltrans said it should have a better idea in the next day or two as to when all lanes might be reopened, but that estimate also depends on a number of factors. "We are not working 24 hours a day," Caltrans spokesman Jim Shivers said. "There are some safety reasons why we don't work overnight. And if we sustain more winter storms, we'll suspend the work." 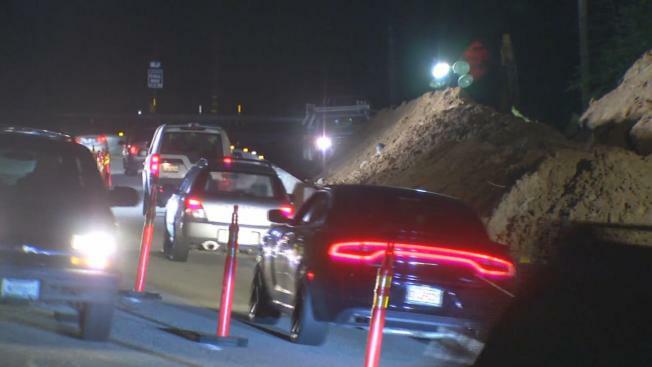 There have been at least three weather-related mudslides in the past couple of weeks, and travelers in both directions between the coast and Silicon Valley have been single-tracking in the two southbound lanes, creating major headaches for commuters. The "spider" was up and running on the hillside, and crews were focused on building a berm at the base of the slide right at the divide between the northbound and southbound lanes, according to Shivers. The goal, he said, is to create a barrier that would catch any more debris coming down into the northbound lanes and prevent it from blocking the southbound lanes. That means for the foreseeable future, all northbound and southbound traffic will continue to share the southbound lanes. Also, when rain arrives later this week, Caltrans anticipates all work at the site will once again stop for safety reasons. Adding to the mess was the indefinite closure of one of the main bypasses, Soquel-San Jose Road. Structural damage was found on the roadway Monday, and it was shut down between Amaya Ridge and Olsen roads, according to Santa Cruz County officials. Also, Highland Way is still closed between post mile 3.06 and Spanish Ranch Road because of a mudslide. For information on highway conditions, Caltrans has a list here. The Santa Cruz County Public Works Department has a list of closed roads here.